Located at the south end of the Coolidge Student Services Support Center in room 142M, next to the Health Office. Clinton Community College has a Lactation Room available for nursing mothers on campus. This nursing mothers room is located at the south end of the Coolidge Student Services Support Center in room 142M, next to the Health Office. 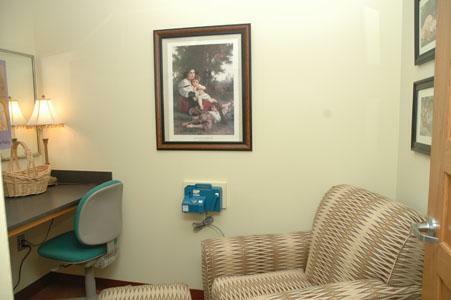 The quiet, private nursing area has a hospital-grade pump, framed art work, which makes the room cozy and inviting, and is also equipped with a sink and small refrigerator that mothers can store their milk in until they leave at the end of the day.